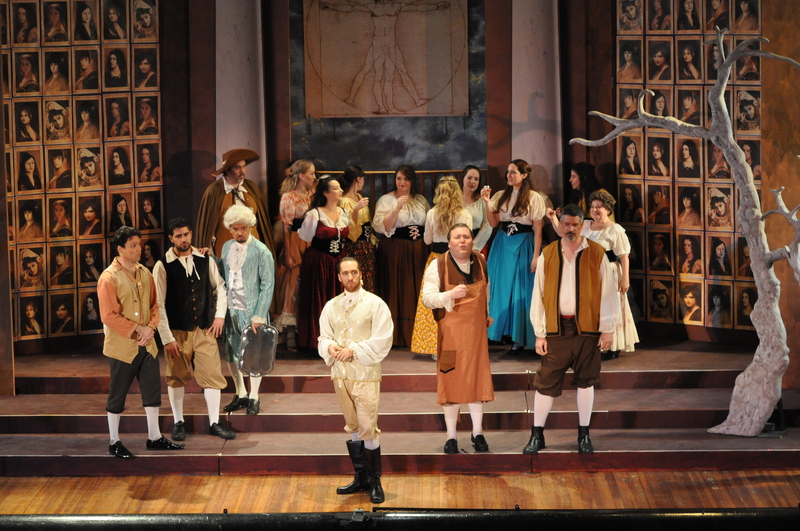 On the afternoon of Saturday, November 19th, Regina Opera began its 47th season with an exciting presentation of Mozart’s masterpiece “Don Giovanni”. Regina Opera is located in Sunset Park, Brooklyn, at Our Lady of Perpetual Help (OLPH) on Sixth Avenue between 59th and 60th Streets. 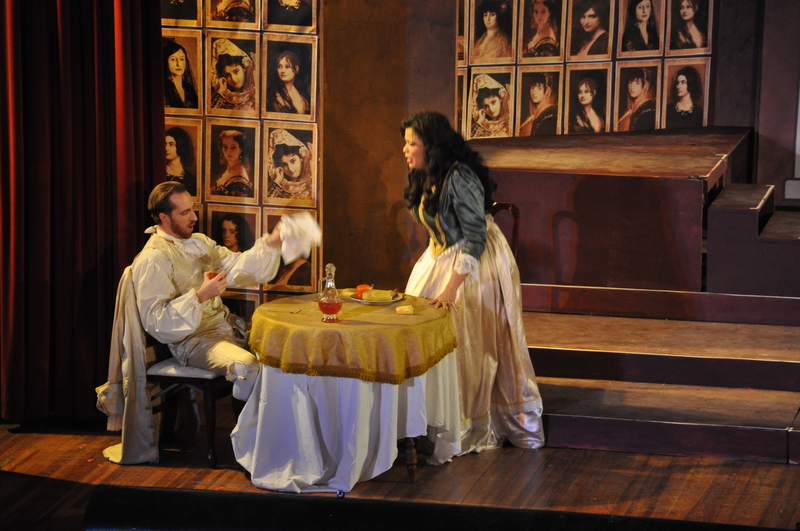 Donna Anna (Christina Rohm) and Don Ottavio (Christopher Nelson). Photo by Sabrina Palladino. “Don Giovanni” had its premiere in Prague in 1787. It was labeled “Un drama giocosa” as a comedy with drama. The libretto was by the brilliant librettist Lorenzo Da Ponte (1749-1838) who was also a friend of Giacomo Casanova. Da Ponte migrated to America and opened the first opera house on Leonard Street in lower Manhattan. Ironically both Da Ponte and Wolfgang Amadeus Mozart (1756-1791) were buried in unmarked graves. 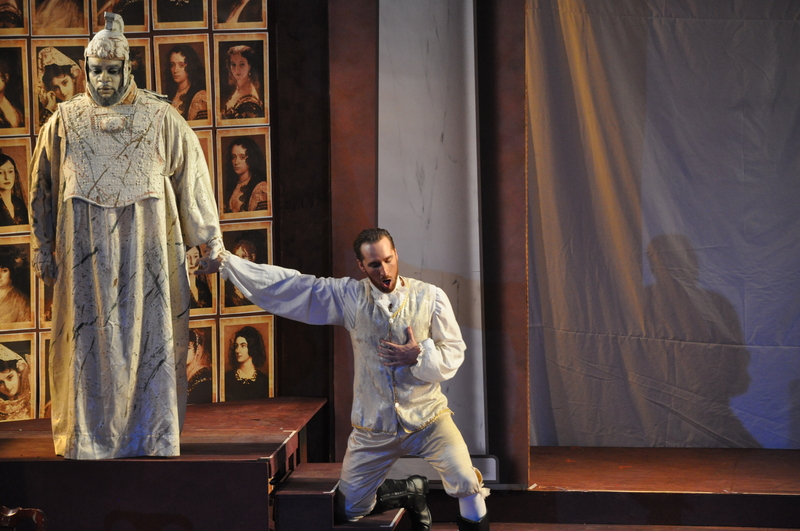 The coveted role of Don Giovanni is every bass baritone’s dream. The Metropolitan Opera’s legendary bassos Ezio Pinza and Cesare Siepi were the definitive interpreters of this great role. I was blessed to have heard them both. At Regina Opera’s performance and as the lights dimmed, Maestro Gregory Ortega began with the ominous overture which sets the mood. 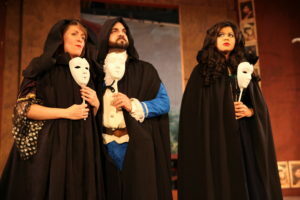 Don Giovanni, a nobleman was portrayed by Nathan Matticks. Matticks has excellent stage presence and a rich versatile baritone with a cutting edge that soars. He sang “La ci darem la mano” with the young bride, Zerlina, with beguiling lyricism. His vocal outpourings in the champagne aria “Fin ch’han dal vino” were brilliantly sung as he was getting dressed. His haunting laugh at the end of the aria as he was running offstage for a new conquest was right on the mark! Matticks’ caressing singing of “Deh vieni a la finestra” melted the heartstrings. His oft times cruel interplay with his loyal servant Leporello was indicative of his basic nature. Mae West’s “Beulah, peel me a grape” has been replaced with “Leporello, peel me a banana” as the Don devours a banana with dinner. Don Giovanni’s scene with the Commendatore was bone chilling. The Don’s cynicism, cunning, and amorality were shocking as was his cavalier defiance of the stone guest. His descent into hell with ear piercing screams is forever deposited in the memory banks of all who witnessed it. A brilliant performance! 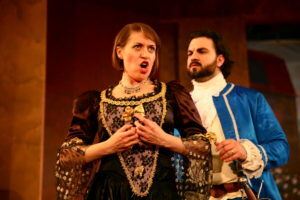 Don Giovanni (Nathan Matticks) tries to seduce Zerlina (Hannah Stone). Photo by George Schowerer. Luis Alvarado played the role of Leporello. His singing of the catalogue aria “Madamina, il catalogo e questo” was amusing, especially his master’s 1003 conquests in Spain! He is the possessor of a rich sounding, somewhat understated basso-buffo. Alvarado sang casually and did not exaggerate, but I thought he could have balanced his pleasing voice with a bit more comedic acting. Alvarado’s voice though plangent, does not have the carrying power that the role calls for and more forceful frustrations and fears would have enriched his interpretation. To his credit, he did get many cheers at the opera’s end. Christina Rohm was Donna Anna, a noblewoman whose father was murdered in a duel by Don Giovanni as the latter was attempting to seduce her. Her singing with Leporello “Notte e giorno faticar – Non sperar, se non m’uccidi” showed her lustrous soprano. Ms. Rohm’s special magic shined in “Crudele, non mi dir,” her passionate versatile showpiece in the second act which was sung with remarkable coloratura precision, power and panache! Don Giovanni (center, in white) surrounded by villagers. Photo by George Schowerer. Don Ottavio is somewhat of a wimpish role and he is so bland and ordinary next to the colorful rapacious Don. But he is sturdy, dependable and sincere as opposed to the Don Giovanni’s rascality. Christopher Nelson was an excellent Don Ottavio. He is constantly outraged by Don Giovanni’s insolence! Mr. Nelson sang brilliantly. His singing of “Il mio tesoro” with its vocal coloratura twists and turns was sung with ease and bravado. His tenor has a beautiful sound and was a joy to hear. Donna Elvira, a lady of Burgos, is like a gnat in Don Giovanni’s eye. She simply refuses to accept the fact that she was seduced and abandoned by him. Yet her indignation melts whenever she sees him by stealth and catches him seducing someone. Zhanna Alkhazova was a perfect Donna Elvira: defiant, pouting, yielding, forgiving, accepting like a jealous weak-kneed shrew. She is the possessor of a sultry, rich soprano with power to spare.“Ah! fuggi il traditor!” and her singing of “Mi tradi” was golden age in its perfection. Zerlina, a peasant girl, was saucily sung and acted by Hannah Stone whose lyric soprano sparkled in duet with Don Giovanni and her naive but sweet spouse Masetto. Her lovely singing of “Batti, batti, o bel Masetto” and “Vedrai carino” were piquant and charming. Her duet “La ci darem la mano” with Don Giovanni was a highlight. Don Giovanni (Nathan Matticks, seated) is interrupted during dinner by Donna Elvira (Zhanna Alkhazova, right). Photo by George Schowerer. Masetto, Zerlina’s betrothed, was poignantly portrayed by Jonathan Hare, whose warm charming baritone made him the subject of affection and sympathy rather than ridicule. He was ever the befuddled, simple peasant. Il Commendatore, Anna’s father was eerily and brilliantly portrayed by basso Antoine Hodge. His singing of “Don Giovanni, a cenar teco m’invitasti” as a statue from his grave, was seeking vengeance. The scene of Don Giovanni’s steadfast defiance, leads to demons that drag him screaming, unrepentant, towards the flames of hell. Hodge’s magnificent cavernous, basso echoing his revenge, will haunt the memory for a long time. The ensemble were all excellent, both the demons in black and red and all the cast characters. Melissa Guardiola Bijur played Donna Anna’s Duenna. All provided great support. It was so nice to see veteran chorister, the perky sweet voiced Cathy Greco on “double duty” selling refreshments during the intermission. Maestro and principal conductor Gregory Ortega led Regina’s 34 splendid musicians in a performance that was captivating and truly evoked the era of the great Wolfgang Amadeus Mozart. From the start, the orchestra played as one. 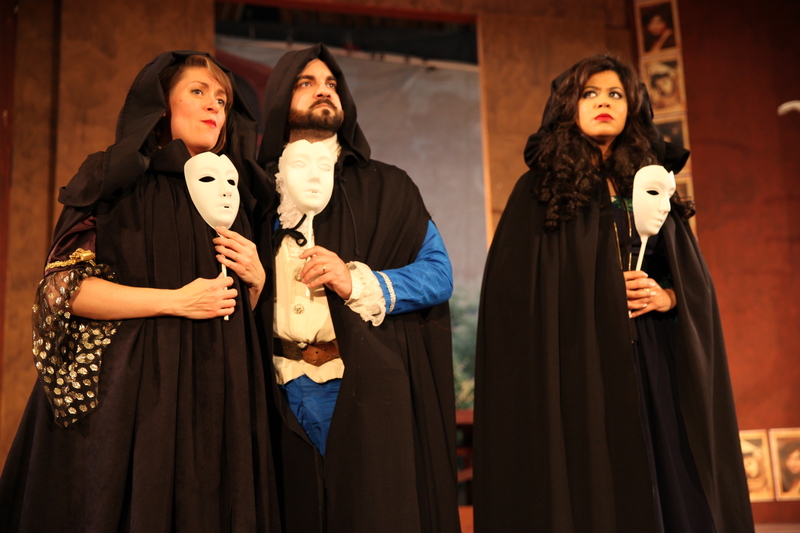 From the minuet to the full powered scenes with the Commendatore, the mood was set! Kudos to Timothy Moody on the keyboard for the serenade and parlando passages. The magnificent costumes were by Marcia Kresge.the excellent make up both subtle and scary was by Milan Rakic. The stage director, set design and dueling sword fight choreography were by Linda Lehr. The stage was filled with many picture portraits of women dominated by the human body design of Leonardo Da Vinci in the center. Various tree branches and floral benches were used to create a stage always vibrant and colorful. 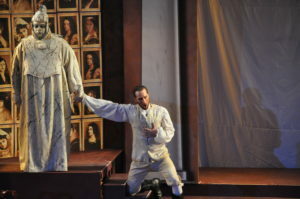 Don Giovanni (Nathan Matticks, right) is held by the Commendatore’s statue (Antoine Hodge) refusing to repent for his sins. Photo by George Schowerer. The Regina Opera owes much to producer Francine Garber. We look forward to this 47th season of serving Brooklyn and opera lovers everywhere.